Bolivian hemorrhagic fever (BHF) gets its name from the country where it was identified. It was first described in human patients in San Joaquin, Bolivia during an outbreak from 1959 to 1963. The disease was initially reported as isolated cases in Beni, located in northeast Bolivia. These cases, which occurred from 1959 to 1962, were referred to by locals as “black typhus.” However, things took a turn for the worse when the disease spread to nearby towns, causing high incidence and mortality rates. When BHF reached San Joaquin in 1963, it infected at least 21 percent of the population of the city, killing 18 percent of those who contracted this illness. At the time of the first outbreak, experts from the National Institute of Allergy and Infectious Diseases (NIAID) reported rodents to be the primary carrier of the BHF. The etiology of the disease was traced back to the previously undiscovered virus, now identified as the Machupo virus (MACV). The MACV is a member of the Arenaviridae (also known as the viral hemorrhagic fevers or VHFs), a family of viruses which have been linked to rodent-transmitted diseases. 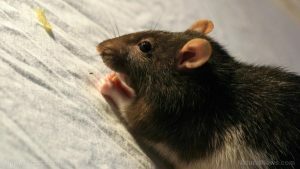 Humans become infected with an Arenavirus such as MACV when they come in contact with rat droppings, either by ingestion or direct contact with broken skin, or are exposed to saliva (through bites) or urine. Indirect contact would include consuming food or water contaminated by rat excretions or inhaling particles in rat saliva and urine found in soiled items like clothing. Once a person is infected, however, other people can be infected with BHF through similar means of exposure. If left untreated, BHF is described to be rapidly fatal. Bolivian hemorrhagic fever affects many bodily systems, but it primarily affects the circulatory system through internal bleeding from the oral and nasal mucosa, as well as bleeding from the bronchopulmonary, gastrointestinal, and genitourinary tracts. As the disease progresses, the nervous and the digestive systems also become compromised. Adequate sanitation is a key consideration for the reduction of BHF. Ensuring that food and water storage areas are kept clean at all times significantly reduces the likelihood that MACV rodents will contaminate your food. Here are some recommended food items that might help prevent or manage the condition. Astralagus has been used in Traditional Chinese Medicine to treat ailments in the heart, liver, and kidneys. Blessed thistle has been used in traditional medicine to stimulate appetite and digestion. Green tea has been shown to decrease viral load in certain carriers. Turmeric is known to treat gastrointestinal conditions, pain, and fatigue. Currently, the U.S. Food and Drug Administration has no approved medication for the treatment of BHF. While studies have been made regarding the efficacy of ribavirin, an anti-viral therapy used for other Arenavirus-caused VHFs, these have only been tested in a minimal amount of human cases of BHF. The main course of treatment of BFG is reducing the progression of symptoms and managing complications. This includes proper management of lost fluids through electrolytes, ensuring proper breathing, and preventing further damage to the kidneys and bladder. Bolivian hemorrhagic fever (BHF) is a viral infection that is primarily caused by rodent transmissions. Symptoms of BHF can start as early as three to 16 days after exposure, and can rapidly progress into death, if not treated. There is currently no cure for BHF, but it can be managed through addressing complications and ensuring it does not advance.